In the Silver City of Cuttack, Durga Puja is unique in more ways than one. While the neighboring State of West Bengal hosts the autumn festival with theme-based pandals and idols, Odisha’s Millennium City of Cuttack decorates the Mother Goddess with gold and silver. In the Silver City of Cuttack, Durga Puja is unique in more ways than one. While the neighboring State of West Bengal hosts the autumn festival with theme-based pandals and idols, Odisha’s Millennium City of Cuttack decorates the Mother Goddess with gold and silver. The extravagance is reflected in 150-odd Puja Pandals across the city; while the elite puja committees go for gold jewelry and silver backdrops spending several crores of rupees, their smaller cousins opt for just silver. The Durga idols are usually 20-ft-high and they are accompanied by even taller backdrops (Silver tableaux). The price rise of gold has never been a deterrent for the Durga Puja Committees in Cuttack who make it a point to decorate the majestic tableaux elaborately with silver filigree work, known as Chandi Medha in local parlance, and idols of Goddess Durga, Lord Ganesh, Kartik, Goddess Lakshmi and Saraswati with gold jewelry and crowns every year. Cuttack is known worldwide for its silver filigree craft and filigree artisans who have created several masterpieces with impeccable artistry in the past. Durga Puja is also an occasion for these artisans to showcase their craftsmanship. 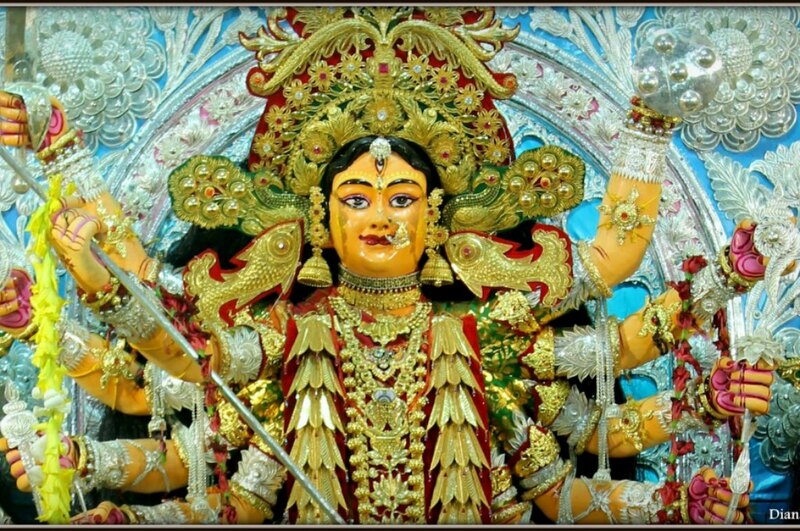 While initially, puja committees used to decorate the Goddess and the tableau with silver filigree work and jewelry to create that dazzle, the trend of adding gold to the deity’s idol was started by the Choudhury Bazaar Puja Committee in 2002, which coincided with its golden jubilee celebration. Durga Puja in Choudhury Bazaar began way back in 1956. The organizers made a golden crown of 7.6 kg for Goddess Durga and since then, they have added golden crowns and other jewelry items to the accompanying deities. Of late, the silver tableau is also being converted into a gold one. While the total cost of the Chandi Medha and idols exceeds Rs 15 crore, the puja committee keeps adding some more gold to the entire structure every year. Subsequently, a group of other puja committees gave a golden touch to their pandals. The Sheikh Bazaar Puja Committee made a 3.5 kg gold crown in 2008 for the deity’s idol that is set against the backdrop of a beautifully carved silver tableau. Over the years, it added gold crowns and necklaces to idols of other deities and even the demon Mahisasura. At Mangalabag Puja Pandal, not just the Durga idol, the other deities too sport golden crowns weighing at least 2 kg and at Chauliagang Puja Pandal, the Goddess is adorned with a 3 kg majestic golden crown fashioned in the shape of a peacock that is decorated with precious stones. In 2004, the Ranihat Puja Committee prepared a 4 kg gold crown for the Goddess at the cost of Rs 1 crore. While the puja at Ranihat was started a century ago, the committee set up a silver backdrop in 2004. According to the Cuttack Mahanagar Puja Committee, the apex body of community puja organizers in Cuttack, there are at least 21 puja committees in the city who have silver backdrops and six puja pandals where the deities are adorned with gold crowns and jewelry. The Durga Puja history of Cuttack dates back to several centuries. It is believed that it was Saint Chaitanya Dev who started worshipping the deity during his visit between 1512 and 1517 AD. During his stay at Gadagadia Ghat in Cuttack, he started Durga Puja at Balu Bazaar. Even at Balu Bazaar, a 30-ft-high silver tableau adorns the pandal and the idol here is painted with only organic colors.